Heat 10-inch nonstick skillet over medium-high heat until hot. Sprinkle both sides of pork chops with garlic-pepper blend and salt; add to hot skillet. Cook 2 to 3 minutes or until brown on both sides. Add barbecue sauce and salsa; turn to coat chops. Reduce heat to low; cover and simmer 10 to 15 minutes or until chops are slightly pink in center, turning chops and stirring sauce once or twice. 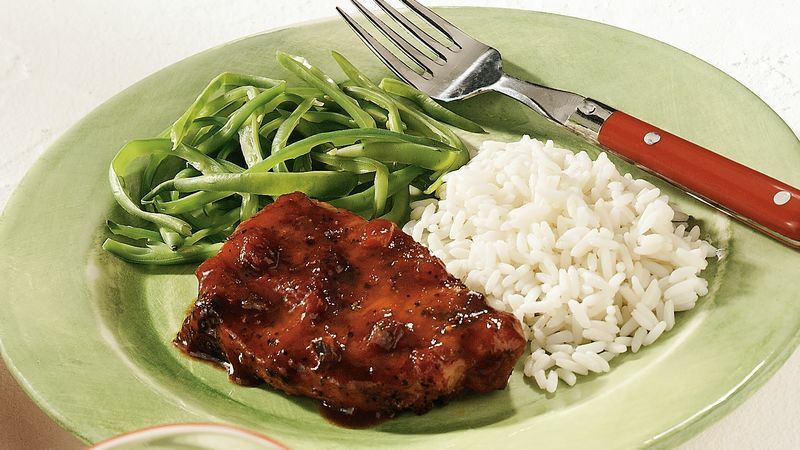 Serve pork chops with sauce. Look for bargain prices on large packages of boneless pork chops, then wrap each pork chop individually in plastic wrap for freezer storage. Thaw the chops quickly in the microwave on nights when you require a quick meal like this.